As an alumnus of the 1964 Free Speech Movement and a veteran of the civil rights movement, I was appalled to read about the recent violent confrontations in Berkeley. Those reports took me back to the 1960s when I was doing voter registration for the Southern Christian Leadership Conference and marching against segregation in Birmingham and Mississippi. Then we were the equivalent of the "fascists" that Antifa and the black bloc are beating up in Berkeley. They called us Communists, not fascists, but like Antifa they believed we were invaders who held them and their Southern values in contempt. The local whites whose towns we marched in burned us with their hate stares, blistered our ears with their curses, threw bottles and firecrackers at us, drove cars into our march lines, and sometimes used fists and bats. Guns were visible. Occasionally someone was shot. Sometimes law enforcement stood between us and our detractors, their faces and rifles always pointed at us, and sometimes they took a vacation, leaving us to the will of the crowd. What we learn from these comparisons is that when a group or a person significantly dissents from deeply held community-wide views it will be attacked when it publicly challenges those views, and the attackers will feel justified without any concern for "free speech" as a more important value. That is dangerous. As UC Berkeley’s Chancellor Carol Christ put it "Once you embark on the path to censorship, you make your own speech vulnerable to it." The University demonstrated the truth of that in its own evolving policies. In the 1930s UC President Gordon Sproul imposed limits on who could speak on campus to persons approved by the administration in order to avoid "exploitation" of the university's prestige. Although aimed at Communists, over time the speaker ban expanded to anyone deemed controversial, including Malcolm X, Nobel Laureate Linus Pauling, and socialist members of the British Parliament. Candidates for public office, including Adlai Stevenson and Richard Nixon, stood in city streets to address students gathered on campus. In 1963, President Clark Kerr and Governor Pat Brown finally persuaded the Regents to abolish the restrictive rules. At that time, state schools in the South would not have permitted anyone to speak on campus in favor of integration. Indeed, at that time Southern whites thought Communism and integration were one and the same. Professors and public school teachers who didn't stand up for segregation were fired. 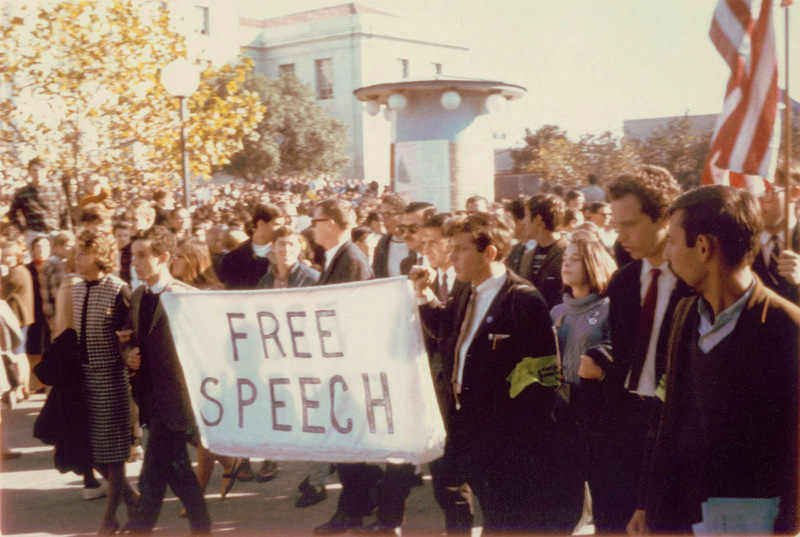 After the UC speaker ban was abolished, the student organization SLATE sponsored a series of controversial speakers, including a couple Communists, Malcolm X and an officer of the American Nazi Party. While there was some picketing, there was no violence. Students responded to statements that they did not like with silence, punctuated by laughter. That was the right response. Now people with unpopular views can't even get a hearing, let alone laughter. Working in the civil rights movement taught me the power of non-violence. It's time to revive that approach. Imagine that when the few dozen Antifas put on their masks and grab their weapons and start pushing people around, that they are surrounded by even more people, trained in non-violence, who link arms and repeatedly tell them to stop. Mass repudiation is a very powerful way to contain potential violence. Joining a non-violent containment squad requires training. You have to be prepared to withstand verbal, and maybe some physical, abuse, all the while keeping your voice down and your hands down. And you have to outnumber those you are trying to contain. To succeed, non-violence requires patience and discipline. Something the black bloc doesn't seem to understand. Establishing a non-violent containment squad can't be done by a state agency, such as the University or the police. Too many legal complications. But it could be done by the churches, or by an independent group committed to non-violence. That's how it started in the South. Long before the sit-ins hit the airwaves, students and young people were being trained in non-violence. Some of the people who did that training are still alive, as are many who practiced it. They should train others in how to do confrontation the right way — nonviolently.